When most bands disappear for six years no-one would fault you for thinking they’re dead. Six years is a long time in any industry and with the changing times, who even knows if they would be relevant in whatever the current landscape is. 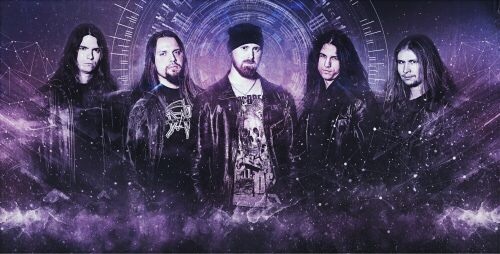 This is the challenge power metal veteran Eagleheart is facing with their new album Reverse. Does their sound still hold up? Or has metal left them behind? As someone new to Eagleheart, I really didn’t know what to expect, but this album is impressive. The musicality is incredibly sharp with Lord of the Rings level orchestral backing, symphonic blending reminiscent of early 2000’s Rhapsody, insane speed on every instrument, and occasional 80’s synth? Sure, okay. Their breakdowns are so fast and clean that it is hard to believe it’s not computer generated and the kick drums pound like a thousand marching soldiers. The guitar solos are a joy to listen to and make me want to bust out my best air guitar. But they’re not just about speed. Eagleheart has an excellent sense of tempo, changing from breakneck speeds to quiet mellow moments with grace that still keeps the intensity of the song while giving the listener a few moments to breath. The dynamic usage of instruments creates this brilliantly woven tapestry of music. It’s awesome. Reverse has this excellent consistency to its songs. They aren’t homogeneous, blending into one big mess; they’re all distinct, but with a through line that lets each song flow into the next. They’re so creative in the inspirations they draw from. Some songs are your familiar power ballads, others have a much heavier feel in the tracks and vocals, and another starts like ancient Egyptian metal. The diversity of sound really makes the album memorable. The vocals are both a strength for the album and one of its greatest weaknesses. The three singers offer such a dramatic range, from the low metal growls to the high power screams. All the while, they keep clean vocal sound and never appear to stumble over any of the demanding sequences. Each singer covers for the other so well that I hardly even noticed when one takes over for another. The lyrics are also a breath of fresh air. They have an underlying positivity to them, about seeing the world how it really is, rising above your fears, and pushing onward. From an artistic side, I have no problem with it. Where my main problem comes in is on the technical side. Through many of the songs, the vocals are too soft for the rest of the music. The singers sound like they’re mumbling, chewing on their words, instead of projecting with clarity. It’s such a problem that even when I listen as closely as possible, I still miss out on some of the lyrics. It feels like something went wrong in production, that either the vocal leveling wasn’t done right or the initial recording was troubled. Because during the quiet moments where it’s mostly just the singers, I hear them crystal clear. Whatever the reason, despite all the professional and epic work that went into the rest of the album, it feels almost amateurish in it’s implementation. There is so much right with this album. The tracks are fantastic, the musicianship on point, and the theming is poetic. This is the kind of album that a band coming back from a six year hiatus wants to drop. It’s impactful, memorable, and compelling to listen to. I would love to give it a full five stars, but the audio issues are such a problem to me that I just can’t justify that. If you can see past the issues, or just have better hearing than I do, than you’ll likely love this album. It’s all the good things of Power Metal. You Eagleheart fans have probably already bought the album and memorized every song. But if you’re like me, without the nostalgia, and the muddled vocals bug you, I still recommend listening to it, the artistry of it is top notch and you’ll still love the music behind the words. You just might not love it as much as it could have deserved.